With around 300 restored motorcycles, automobiles, power products, and racing machines on display, the Honda Collection Hall is a must for any Honda enthusiast visiting Japan. Located near the vicinity of the Twin Ring Motegi race track some 150 kilometers north of Tokyo, the Honda Collection Hall represents what the carmaker calls “the real Honda.” As such, it’s an ever evolving, highly curated collection that shows the different chapters in the carmaker’s storied history. Greeting visitors at the main lobby are some of Honda’s most important vehicles such as the S360 open-top sports car and its first Formula One winning car, the RA272. To the right of the main lobby is a special exhibition dedicated to the Twin Ring Motegi race track as well as Honda’s future as embodied by the Honda Robotics robot, ASIMO. Moving up, the second floor lobby contains two examples of Super GT (Honda HSV and Nissan 350Z) and Formula Nippon / Super Formula racing cars. From there, the entire floor is dedicated to Honda’s production motorcycles, automobiles, and power products. It traces the Japanese carmaker’s manufacturing history with painstakingly restored vehicles that look like they’ve just rolled off the production line. Some examples include several Civics including the first-generation CVCC, CRX, and EK9 Type R. For motorbikes, the collection includes several Honda Dream models, CB-series models, and of course, the Cub. Onto the third floor, the Honda Collection Hall goes high adrenaline. Here, the focus is on the carmaker’s spirit of challenge through its various racing cars and motorbikes. The collection includes various Formula One racers including Ayrton Senna’s McLaren-Honda MP4/5B and the Williams Honda FW10; several touring cars and even the 1995 NSX Le Mans racing car. 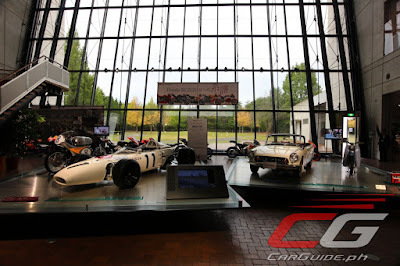 The lobby also showcases two endurance racing cars and two Formula One cars. Getting to the Honda Collection Hall takes some effort. The easiest and most straightforward way is to get there by car. It’s a two-and-a-half hour drive from Tokyo. Other options include taking a Shinkansen (bullet train) from Tokyo to Utsunomiya Station (about 1 hour) then a taxi or bus (about 1 and a half hours) to Twin Ring Motegi. Take note though that the bus going to the museum is operating only on certain days so it needs planning in advance. Tickets cost 1,000 yen (~P 454.89) for adults, 500 yen (~ P 227.45) for children aged 6-15, and 300 (~ P 136.47) yen for children aged 3-5. There’s also a separate parking fee of 1,000 yen for cars and 500 yen for motorbikes.